#19781 at N. Freedom, August 18, 2001. #19781 and her two sister cars were originally owned and operated by the North Western Refrigerator Line Company (NWX) of Chicago. 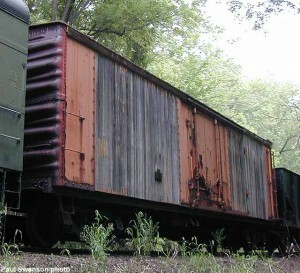 While their exact built date is unknown, they were most likely constructed by American Car & Foundry between 1926 and 1929, when NWX was adding many new 40 foot reefers to their fleet of over 3,000 cars. #19781 and her sisters worked exclusively in service for the Chicago & North Western Railway, which enjoyed a close working relationship with NWX. 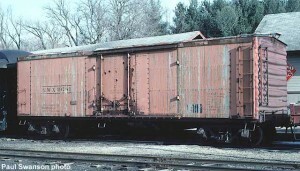 #19781 and her sister cars were rebuilt in 1959 with new steel carbody ends, steel door openings, and new plug doors. At this time they were painted reefer orange (NWX’s previous scheme was yellow and green). They finished their active career by the 1970’s and became storage cars for Circus World Museum at Baraboo, 7 miles east of North Freedom. In 1989, the cars were deemed surplus, donated to Mid-Continent, and moved to North Freedom. Today, #19781 is used for storage of car parts and equipment.